Dean McNamara is an experienced exercise physiologist and sports scientist. Dean has held sessional lecturing positions at the Australian Catholic University in Sydney since 2007, in both the Undergraduate and Masters of Exercise Physiology program. 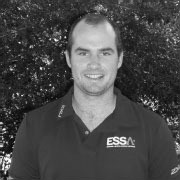 He currently holds both accreditation as an Exercise Physiologist (AEP) and Sports Scientist (ASP) with Exercise and Sports Science Australia (ESSA). He has also held previous positions in research at UNSW addressing injury mechanics in Rugby Union. Dean has a strong interest in the sports science and the management of athletes. He has completed a PhD at the Australian Catholic University. The focus of his PhD is monitoring workload and fatigue in elite cricketers. He is also a consultant Strength & Conditioning coach for Cricket NSW. Dean has worked extensively in both musculoskeletal rehabilitation and chronic disease management as a clinical exercise physiologist. He understands the workers compensation system and aims to restore functional gains for injured workers.